Extreme Networks CEO Charles Berger: "The change for Extreme vs. where we were prior to the [Enterasys] acquisition is pretty dramatic." It’s been about 15 months since Extreme Networks completed the acquisition of Enterasys Networks, a move that bolstered not only Extreme’s financial heft, but widened its switching line and beefed up its wireless LAN capabilities. Extreme CEO Charles Berger gave IDG US Media Chief Content Officer John Gallant an update on the progress of integrating Enterasys’s technology and discussed how software-defined networking is reshaping the industry. He also discussed how Extreme’s work on in-venue wireless with NFL teams and others will benefit all customers. What has the company accomplished since acquiring Enterasys and how is what you’re bringing to market different? The change for Extreme versus where we were prior to the acquisition is pretty dramatic. The most obvious impact is that we’re a $600+ million company now, which puts us in an entirely different league in the Ethernet networking space. We just had a presentation by Dell’Oro [Group, a research company] where they break the market into three groups of companies; HP and Cisco as the market share leaders, ourselves, Dell as the other relevant companies and then the third is the other half-dozen [companies] who don’t really matter. So scale was important. Second, [the acquisition] completed the product line for us. We were not productively active in wireless. We think wireless will become ever more important as mobility rises and Internet of Things explodes. We’re the only one beyond the two or three majors that have the complete wired from the core; the data center out to the outdoor access points and everything in between. It brought us NetSight, which manages the complete range of switches. Then finally it brought some key infrastructure around sales and marketing that we had not invested in at Extreme. It also brought the challenge of integration which is now mostly behind us. Our customers would tell you they see an entirely different Extreme than they did 12 or 14 months ago. 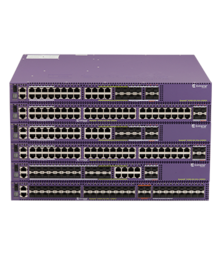 offering around the next generation of Extreme fixed switches. We’ve just released our X460-G2, for example. But [we’re] continuing the S and K modular class and the operating system to run those for customers who want the advanced policy capabilities, network access control capabilities and what NetSight brings to the party. So we’ve merged or are in the process of merging the fixed and stackable lines, but for the foreseeable future we’ll maintain the legacy Extreme and legacy Enterasys modular switches and the operating systems that support them. You mentioned the Dell’Oro report and that touches on a key question. You have giant providers like Cisco and HP in the market, along with more recent entrants like Arista Networks. Help customers understand Extreme’s position compared to companies like those. What are the differentiators for Extreme? You’re certainly right that the landscape is changing dramatically. You’ve got HP breaking itself into two companies and Juniper backing away from the enterprise marketplace.